Sense Of Place Asheville: Rising Appalachia : World Cafe Sisters Leah Song and Chloe Smith put a new spin on mountain music. Sisters Leah Song and Chloe Smith grew up with Appalachian music, having been carried by their artist parents to festivals and mountain-music gatherings around the Asheville, N.C., area. The banjo- and fiddle-playing sisters embraced that music in their own way and formed the band Rising Appalachia in 2005. Their latest album is last year's Wider Circles. Song and Smith have also created what they call the "Slow Music Movement," which works to humanize the touring experience with more community interaction along the way and the smallest possible carbon footprint. 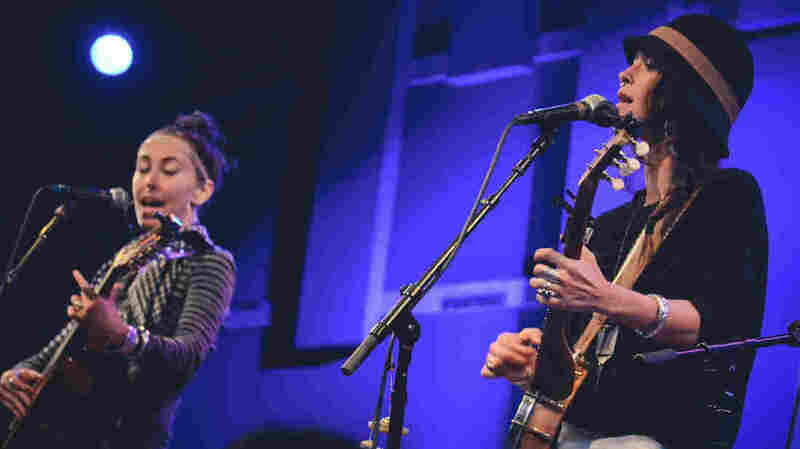 Watch Rising Appalachia perform live in this video, shot in Philadelphia at World Cafe Live.